It’s not been a good time for DC’s biggest superheroes making sound decisions lately. Last week, Superman’s idea to restore his superpowers was very dumb, and it lead to him getting a silly new superpower. 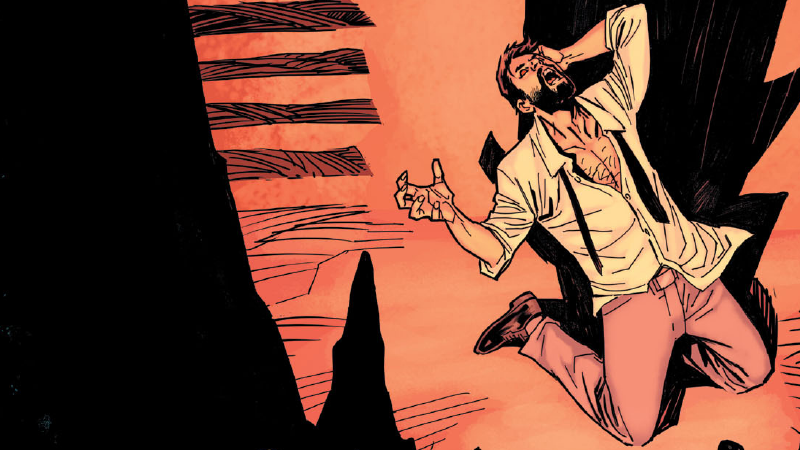 This week, Bruce Wayne made a decision that has huge ramifications for the future of Batman... which was both dumb and mind-bogglingly confusing. Naturally, there are major spoilers ahead for today’s Batman #49, by Scott Snyder, James Tynion IV, Yanick Paquette, Nathan Fairbairn, and Steve Wands. You’ve been warned. The Batman ongoing has been building up to the decision to return Bruce Wayne to the Bat-cowl for quite a while now, and it’s finally happened. After Bloom seemingly guts Jim Gordon and unmasks him as the new Batman for all of Gotham to see, Bruce finally confronts Alfred about the Batcave, ready to do what he needs to to save the city. This is actually really tragic. Bruce and Alfred’s conversation is remarkably well done, and you can’t help but feel for Alfred as he furiously tries to stop the man he’s spent most of his life trying to protect from making a decision that robs him of his happiness. It’s a debate that keeps circling throughout the issue, as Alfred compares Bruce’s return to being Batman to killing the man Bruce has become. But then you find out how Bruce plans to instantly turn himself into Batman, as he currently has none of the memories of the experiences or training that turned him into a hero. But “Futures End” had the excuse of being a flash forward story. This just seems a little ridiculous, a cheap way to have an instant Bruce Wayne-as-Batman, just in time for Batman v Superman to hit theaters. Honestly, if it wasn’t for Alfred’s heartbreak, this entire issue would feel like a terrible sidestep in what has otherwise been a great arc. Everything is just too convenient, like we missed a few issues which sets this up as a plausible path for Bruce to go down. The sudden future science coming out of nowhere is also compounded by the fact that the issue intersperses Bruce and Alfred’s argument with trippy looks at alternate Batmen, all at once painting them as future clones, multiversal doppelgangers, and even repressed elements of Bruce’s psyche, as they all fail and die, ready to be replaced by new Batmen. It leads to some fantastic visuals from Yanick Paquette, with tons of beautiful splash pages depicting the alternate Batmen as Bruce tries and tries again to get the machine to work. But it complicates the actual heart of Batman #49, the debate between Alfred and Bruce, and already makes an issue that’s already pushing the realms of comic book believability even more confusing. But Bruce’s Insta-Bats machine doesn’t work. Instead, it nearly kills him every time he tries to use it. He eventually decides that he has to actually die for it to work, brain death giving the machine a blank slate to work on—no more Bruce Wayne, but a living Batman once more, pretty much negating the wish he had a few pages ago to create a new, happier Batman. Alfred can’t make the decision to kill Bruce... so in steps his current romantic entanglement Jules Madison, who out of nowhere reveals that she knows Bruce used to be Batman, and that he has to die to be Batman again. Also? She’s surprisingly okay with killing the love of her life just so Batman can be reborn. It’s all just so convenient that none of it works on an emotionally satisfying level. It’s Jules who pushes the button, and Bruce Wayne dies, only to be revived moments later as Batman, who’s seemingly none the wiser about everything that just happened to him, but is also ready to go save Gotham. So yes, as we all expected, Bruce Wayne is Batman once more. But is he really? The Batman we knew for so many years died with the Joker, reborn as this new man who had lost everything he had as a hero but gained an actual life, friends, and a love the old Bruce Wayne never had. Fans might grumble that he was no longer Batman, but it’s actually quite sad that that Bruce is now “dead”, his mind erased and replaced with a stock Batman conciousness—like the Dark Knight is a perfunctory OS update. This was a Bruce Wayne unlike anything we’d got to experience before: a Bruce Wayne that was allowed to be happy. Is Batman still Batman when you carve out Bruce Wayne and just implant a bunch of “How to be Batman” memories in him? We’ll have to wait and see to find out.